I really, really love a good wordless picture book. Like, seriously love. The illustrations are invariably magnificent because they need to carry the story, and the nuance and underlying messaging that can change from reader to reader is just the absolute best. 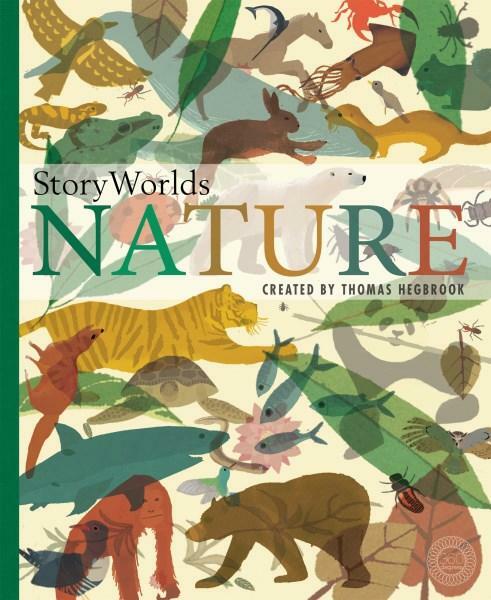 In Story Worlds Nature, Thomas Hegbrook explores this concept in a non-narrative way, taking small slices of 'story' from the world of wild animals and presenting them in vignette-style imagery across double-page spreads. Each image contains a micro story that children can ponder and explore, coming up with their own version of what might be happening. From birds building nests and hedgehogs nuzzling their way in and out of fallen leaves, to frogs forming from eggs and ladybirds nibbling a leaf, this is a fantastic way to encourage both imaginative and critical thinking. Baby animals grow into large. Hunting animals take their prey. Dung beetles get rolling and dolphins stop by to send out sonar signals. Page after page of animal delight will have kids cooing over what might be happening. At the end of the book, each image has been thumb-nailed, with author notes on what's been happening in each micro story. Kids can either look these up or think of their own imaginative take. Graphic-style imagery is luscious in its colour palette, and is absolutely charming to wander through. 360 Degrees is an imprint of Little Tiger Press. Its goal is to produce books with a 'panoramic look at the world', and StoryWorlds: Nature most certainly gives a unique, broad and enchanting view.